January 2015 n Performance & Hotrod Business n 43 A Way of Doing Business Long Motor Corp. started in Leo Long's garage. The Kansas City engineer had a pas- sion for British-made Sunbeam sports cars. Long's hobby was restoring British cars. In 1975, he began selling parts for MGs, Austin Healeys, Triumphs and Sunbeams. In 1979, the business went under. He lost everything. Long started over from scratch in 1981, founding Long Motor Corp., Victoria British Ltd. and Black Dragon Automotive. He repaid all of his debts from his first business endeavor and hasn't looked back. He was focused on customer satisfaction and created catalogs to make it easy for the car and truck enthusiast to see what they needed. He also stressed stocking quality parts and getting orders shipped quickly and accurately. In 1993, truck parts were added to the mix. 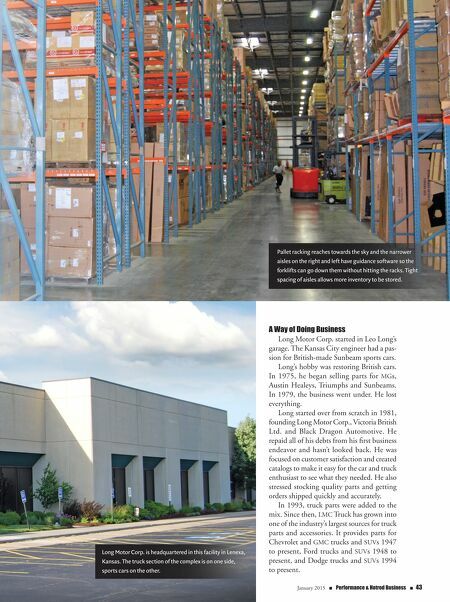 Since then, LMC Truck has grown into one of the industry's largest sources for truck parts and accessories. It provides parts for Chevrolet and GMC trucks and SUVs 1947 to present, Ford trucks and SUVs 1948 to present, and Dodge trucks and SUVs 1994 to present. 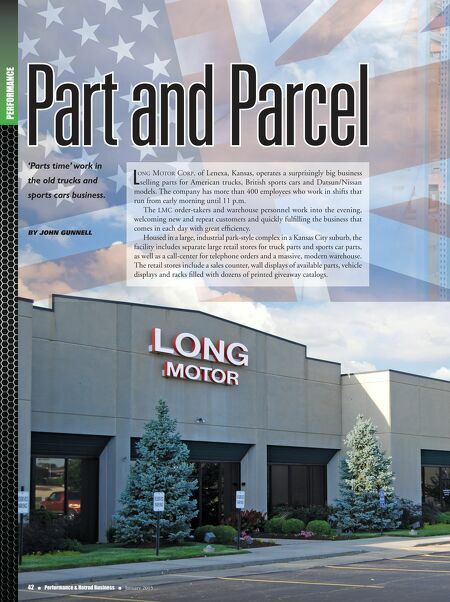 Long Motor Corp. is headquartered in this facility in Lenexa, Kansas. The truck section of the complex is on one side, sports cars on the other. Pallet racking reaches towards the sky and the narrower aisles on the right and left have guidance software so the forklifts can go down them without hitting the racks. Tight spacing of aisles allows more inventory to be stored.